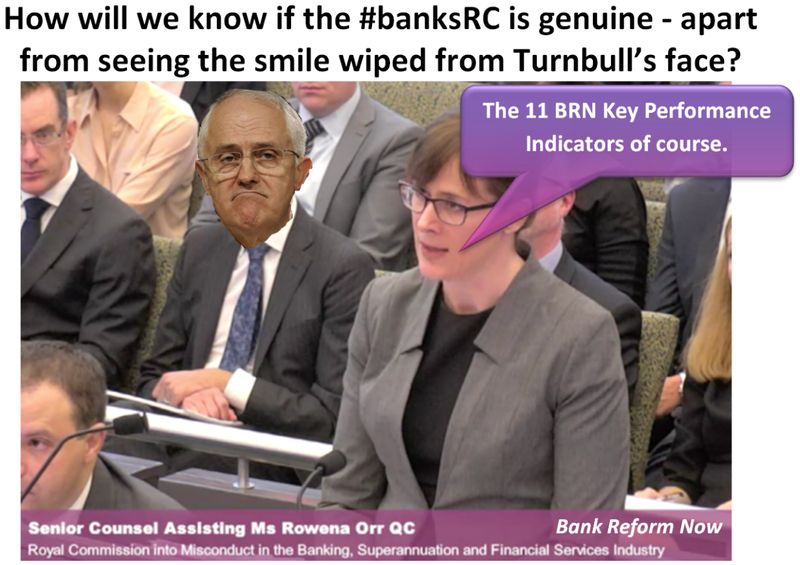 Turnbull and the banks wanted a sham Royal Commission into the the finance sector. BRN has released 11 Key Performance Indicators to help us identify whether the Hayne inquiry is genuine or not. The Commissioner has the powers required to make sure each point is met. Will he do the job? Apart from successfully meeting the KPIs the other measure of the Commission's worth will of course be the brightness of the smile on the Turnbull dial. As the second round begins at the Hayne Banking Royal Commission BRN CEO Dr Peter Brandson has released the Key Performance Indicators that the Royal Commission must meet for it to be considered a fair dinkum inquiry. A sham or whitewash is likely without these standards being met. 1. Ex-bank CEOs – Cameron Clyne (NAB), Mike Smith (ANZ), Ralph Norris (CBA), Gail Kelly (Westpac) – must be called in for interrogation as should current CEOs. 2. Lying to the Commission is a jailable offence. The next banker to commit perjury should be jailed by Commissioner Hayne. Bankers will know he is serious and we will see a new degree of honesty from bankers and their lawyers. 3. Witnesses should also include people who were not gullible or irresponsible. We must see open and shut cases of predatory asset stripping. Call in NAB victim Faye Andrews. If Faye is not compensated fully as a result of this inquiry it is a 100% bank controlled sham. Absolutely no doubt about it! 4. Banks don’t commit crimes - people do. Hayne should call in the actual bankers that did the crime not a bank lackey putting on a performance saying “sorry about that, we might have made a mistake …. looks like a computer glitch.” The law must be applied to protect citizens from corporate criminals. 5. We already know about the long list of scandals – rate rigging, financial planner & insurance rip offs, money laundering, CBA/Bankwest etc. Uncover more issues we didn’t previously know about like the NAB Introducer Program and the Flex Commissions racket …. Even if it means a 2 or 3 year RC. 6. Let’s see a serious inquiry into the legal profession’s role in assisting bank criminality. Perjury, conflicts of interest, tampering with court transcripts & evidence, essential files vanishing and inexplicable behaviour of certain judges. Bankers have crucial accomplices in law … as well as liquidation and valuation. Expose it. 7. Terms of RC must be extended and must include bank victim restitution & compensation … and legacy cases of historical financial abuse must be included e.g. NAB victims Erika Biritz, Rita Troiani, Dario Pappalardo & Malcolm Taylor; CBA victims Tony Rigg, Giulia Mandarino and Debbie & Jim Barker; ANZ victim Thomas Brookes – see BRN website for the Gold Standard Terms of Reference and more cases of unconscionable conduct including the horrific NAB / Dr. Barry Landa scandal. Hayne must also look at the regulatory failure that has led to the need for his Royal Commission and include investigation of macroprudential regulation & APRA. 8. The nature of the bank contract and the promissory note in lending must be forensically dissected. 9. Do any of the main players in the RC itself have any past dealings which could be considered a conflict of interest? If so disclose them and work out how to proceed. 10. Bonus Points – if RC looks into arguments advocating Equality of Arms - i.e. bank victims having access to the same legal expertise and support as the banks. 11. Super Bonus Points scored if Hayne finds that bank crimes will only be significantly reduced if crooked bankers are jailed - after their assets are seized - and their victims receive full compensation. If people are not satisfied with the integrity and effectiveness of the Royal Commission then it is clear that for justice to be done it will be up to the people to take action. The Big Bank BANG - fighting for justice one bank at a time - is the first step in the action required. Bankers only care about their brand and their bottom line. Take action from April 22. It is simple, it won't cost you anything but it will cost CBA a packet and it will put the other banks .... and the government on notice. If you want to help with donations to help turbocharge our campaign see link below. Also below - critical cases and information. We have the power and we will use it..!! "Any crisis - whether genuine or manufactured - will be used by unscrupulous politicians and interest groups to progress an agenda that is against the best interests of the people."